One of the main concerns you may have about your aging loved one remaining at home is their safety. For example, falls can be particularly dangerous for seniors. Ordinary obstacles like steps are risky. The hazards of the average home are numerous for those in a later season of life. Some hazards are obvious. Old, malfunctioning appliances, for instance, clearly put your loved one at risk. Clutter, poor lighting, pets, and other apparent tripping hazards can all make it difficult for your loved one to get around. Other hazards are subtle. These 7 hidden hazards for seniors tend to be overlooked even though they are common. To ensure your loved one’s safety at home, take precautions to protect your loved one from danger. Seniors often have difficulty with their gait and balance. In some cases, falls are even directly related to gait and balance disorders associated with aging. Difficulty with balance, in particular, can make stairs and steps challenging and risky for your loved one. To minimize this hazard, enable your loved one to live on one level as much as possible. Install a stair chair. 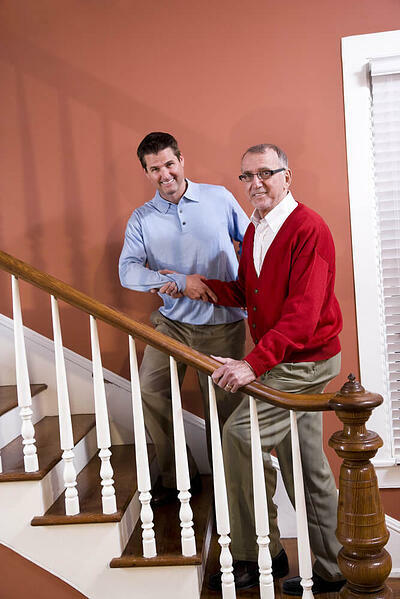 Encourage your loved one not to climb stairs without the help of a caregiver. Often, seniors have to step up over a lip to enter their bathtub or shower. Since tubs and showers tend to be wet, they can also be slippery. Protect your loved one from harm in the shower or bathtub. Install a specialized, easily accessible tub. Use a shower chair and install safety bars. Some shower chairs allow a user to slide from the outside of the tub to the inside safely. Install a handheld showerhead. Caregivers can also be instructed to help with bathing. Nearly every type of flooring carries risks. While carpets and rugs can be a tripping hazard, hard floors can be slippery. It’s important to assess your loved one’s home. A free in-home assessment can help you determine what types of flooring are safest and if any equipment can be installed to help your loved one get around safely. If your loved one requires medication to stay healthy, you may need to take steps to ensure medication is helpful instead of hazardous. Your loved one may be at risk of forgetting medication, taking too much, or struggling to access medication. One of the roles a caregiver can play is to offer reminders to your loved one. A risk for anyone, smoke and fire can be deadly. Unfortunately, aging people sometimes have difficulty detecting smoke or fire. If they are hard of hearing, they may not be alerted by alarms. Seniors with mobility challenges may have trouble escaping a fire or reaching a phone to call for help. Keep your loved one safe with loud alarms. Place phones around the house in many easily accessible locations. Provide caregiver services so that your loved one is not left to their own defenses in case of emergency. Getting to and from the toilet can be a challenge for some seniors. Located in a bathroom, toilets can also be hazardous because of their isolation and placement near water sources that may be slippery. Toilet safety can be improved by the installation of support bars and toilet seat extenders in the bathroom. Caregivers can also provide assistance. It may seem more like a sad truth than a hazard, but isolation can actually be dangerous for your loved one. There are practical reasons, like that if your loved one is alone and unable to call for help, they may be in a dangerous situation for longer. According to medical research, social isolation is also linked to greater risk of death for seniors. Companion services can provide company and comfort to your loved one, protecting them from isolation. Minimizing risks for your aging loved one often requires making minor adjustments to the home. Medical alert systems are often an important addition to providing a safe environment. In many cases, home care is the most effective way to protect against the most common hazards of remaining independent as a senior.